It was a bold choice for a forty-something actor/producer Hugh Jackman to return to the X-Men movie franchise that has been aging faster than he has, then do it with his shirt off more often than the previous two movies combined. It was an even bolder choice to touch-back on the beloved Wolverine limited series of comic books from the 1980’s. I walked into the theater knowing that Jackman had done the heavy lifting (literally) to pull off the shirtless scenes, but I cringed in fear at what the franchise would do to Logan’s other epic romance: Mariko. This Japan-centered plot line was one of the most humanizing and dynamic story arcs for the original comic book hero in his first fifteen years of existence. The cinematography does the same dance across the line from the sublime to the silly, with very little space in between. When the first atomic bomb drops, it’s clearly visible all the way across the harbor. The picturesque mountain village has a high-tech skyscraper version of a feudal stronghold. The actors do a good job with the script they’ve been given, but it is an American script through and through. A movie set in Japan with only three American characters has no one attempt to save face or avoid disturbing the public. The movie mines the dichotomy between modern and traditional Japanese ways for humor, and it would have been brilliant if the script writer had a better grasp of tradition. If Hugh Jackman insists on playing a Wolverine with none of the refinements or depth of the original character, he plays it consistently. Jackman is a talented actor and he goes with the flavor he can deliver in the character he’s playing. One-liners are not omnipresent, but they are dropped with skill and understated timing. As part of the X-Men movie franchise this film goes a long way to redeem Marvel from the tragedies of X-Men Wolverine: Origins and X-Men: The Last Stand, and it’s good to see the upswing continuing that Marvel began with X-Men: First Class, possibly the best installment in the franchise. It’s a fun romp of comic book action, and unless you’re a hard-core fan you’ll find this movie worth watching. There is nothing in the movie that requires 3D, so save yourself some money, catch a Matinee if you can, and have some not-so-mindless fun. Don’t forget to stick around through the credits for the teaser to Days of Future Past! The original Mariko/Logan romance revealed great depths about Logan’s character. He spoke Japanese and knew the culture thoroughly, and a great deal of the romance between them was that Mariko had the depth of perception to see that Logan was truly Samurai in spirit while most who claimed the traditional ethic failed. 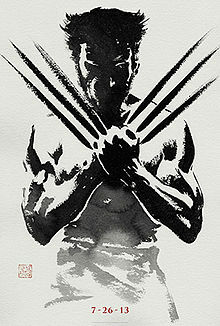 Hugh Jackman’s reinterpretation of the character, while fun to watch, endlessly physical, lacks almost all of the depth of the original, which leads to the saddening conclusion that children’s comic books can convey more range of characterization than professional, accomplished adults. Jackman’s range as an actor makes this a tragic choice rather than a lack of ability on his part. The one point of depth that surprised me with its power were the dream sequences between Wolvie and Jean Grey. Kudos to director and both actors for these, but there is more to Wolverine as a character that romance and violence. Tragically, I’m beginning to think that there is not much more to Hollywood. So I will end the review with one final thought. One nice thing about the X-Men movie adaptations of the great X-Men stories is that you can watch the movies and then buy the graphic novels to see the real story. You don’t even have to worry about spoilers, because the names are the only thing they haven’t changed. Regarding Mr. Jackman’s heavy lifting, I hope you’re aware that he used steroids to enhance his physique as do almost all professional athletes and many actors/entertainers. I allowed this comment to make a simple scriptural point. Gossip is a sin. When your gossip ascribes criminal activity to another, the Biblical term is slandering or reviling. 1 Corinthians 6:9 Or do you not know that the unrighteous will not inherit the kingdom of God? Do not be deceived: neither the sexually immoral, nor idolaters, nor adulterers, nor men who practice homosexuality, 10 nor thieves, nor the greedy, nor drunkards, nor revilers, nor swindlers will inherit the kingdom of God. Let professional athletes tend to their temptations. I shall tend to mine. Tend you to yours and we’ll call it even.